The Greater Haverhill Chamber of Commerce is happy to announce the addition of a new program to their morning line-up. The “Coffee with the CEO” offering will begin in March bringing another high-quality offering to the local business community. This first session will feature an hour with Thomas Mortimer, CEO of Haverhill Bank, providing local business men and women an intimate question and answer session to gain insight and answers to business challenges. This program will act as an informal mentoring program for young professionals, entrepreneurs and small business owners who may face challenges in launching or building their careers. Additionally, it is an excellent opportunity for established professionals to come together and brainstorm possible solutions for real-life business challenges currently holding them back from achieving the next level in their careers, or achieving their business goals successfully. The Coffee with the CEO series will take place monthly from 8 – 9 AM and is open to GHCC members and their guests. Continental breakfast will be provided. The March program will take place on March 22, 2016 at Haverhilll Bank, 180 Merrimack Street, Haverhill. Registration is required. Cost is $5 Members and $10 Non-Members. Seats will be filled on a first-come, first-served basis. Thomas Mortimer was born in Flushing, NY to Thomas and Marion Mortimer, and grew-up in Warwick, RI. Tom achieved his Bachelor of Science in Finance from Northeastern University and an MBA in Finance from the University of Massachusetts-Lowell. While completing his education he received several awards including: Captain of the Northeastern Track Team; Earned All American Honor in Track and Field; and was inducted into the Northeastern Athletic Hall of Fame. 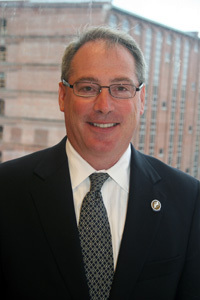 Tom entered banking in 1981, currently serving as President and CEO of Haverhill Bank. Prior to Haverhill Bank, he served as Executive Vice President/Chief Credit Officer at Pentucket Bank. He is extremely involved in his community serving as: Greater Haverhill Chamber of Commerce: Chairman of the Board; Massachusetts Bankers Association: Board of Directors; NECC Foundation: Chair of Finance Committee; Penacook Place: Chairman of the Board; and Greater Haverhill Foundation: First VP/Board of Directors to name a few. Tom resides in Haverhill with his wife Katina (married over 30 years) and has three adult daughters, Heather, Tatum, and Courtney. He enjoys spending time with family, dining in Boston, vacationing in Newport, RI, and playing golf.